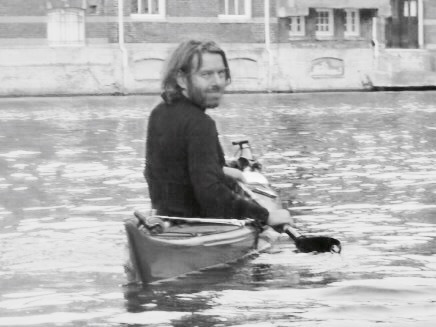 I founded Zeebaard in 2014, my own company where I organize kayak trips in cities with historical towncenters. The aim was to offer trips 3 to 4 months a year in addition to my existing job. I wanted to offer my guests a nice light boat with a good seat and a relatively light paddle. At the start in 2014 I only offered tours in Haarlem and because I still had to build up brand awareness I was still hard to find for potential visitors. In 2015 I started offering tours in Leiden (my hometown) in addition to Haarlem, which resulted in a continuous stream of visitors. 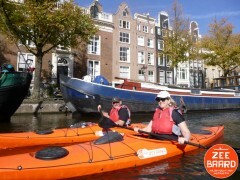 Guests could leave a review and that helped me to have more visitors into the kayaks every year. Although the number of visitors increased, the company was not yet viable. That is why, as an experiment, I organized 2 trips in Amsterdam that year to discover if there were opportunities in Amsterdam and how to deal with the busy canals and the presence of the many commercial tour boats. The visitors to these trips were enthusiastic, but I discovered that I had to adjust the route to keep it safe and manageable. 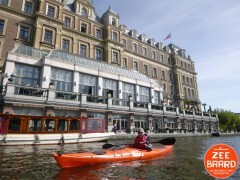 In 2016 I continued and tuned the tours in Amsterdam and since then I am well able to guide a group of kayakers through parts of the towncenter and guarantee a majority level of safety. Every year after that I was happy to have more visitors with me and I received very good reactions and nice reviews from my guests. 2017 Was a good year with more visitors and good reviews. 2018 Was an excellent year and marked the discovery of the Amsterdam city tour by a large group of people. The three cities of Haarlem, Leiden and Amsterdam provided enough variety so that the trips were not boring for me as a guide. 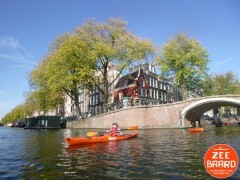 Because of the many canals, Leiden offers the flexibility to sail a little differently every trip. 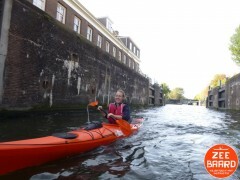 In Amsterdam I could extend the route in different ways if the guests had just a little more paddle experience and speed. So everything went well, but why did I stop? I am the happy father of 2 sweet young children. My daughter is currently 3 years old and my son will be 5 in June this year. Compulsory education will apply in the Netherlands from the age of 5, which means that I can only go on holiday with my family in high season. That is precisely the period in which I receive the most visitors and that feels like a baker who doesn’t sell sandwiches during lunch. In addition, offering the tours is very time-intensive. The sailing days are long and I also have a to handle all the sign-ups in the evening, answering emails and making schedules at the expense of the time with my family who want to spend more time with me in the summer because there is no school. That made me decide to stop offering the tours. I have sailed every trip with a lot of pleasure and when I look back at the photos in the logbook, memories pop up with almost every individual trip. Thanks to all the guests I have been able to guide in recent years! And maybe, just maybe in the future, if time permits, I will start on similar activities again.